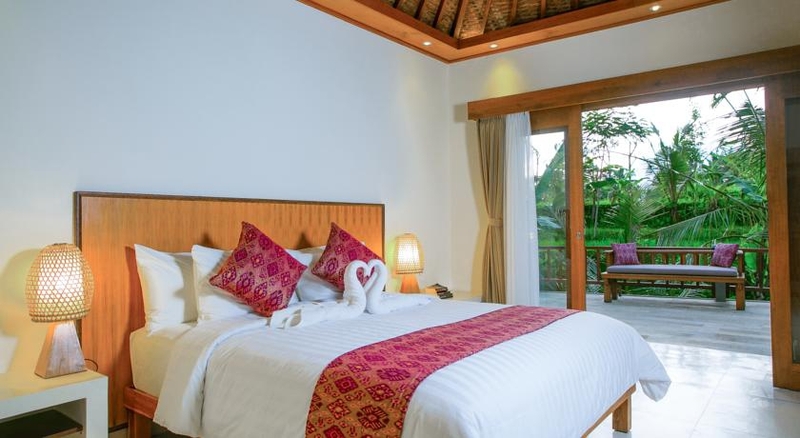 Situated beside a running stream amongst rice terraces and coconut palms, Villa Pesantian is a 10 minute drive from central Ubud and a 90 minute trip from Denpasar Airport. Tranquility is key and relaxation immediate, as you enter the turquoise traditional Balinese door and saunter down to the lobby. This secluded little place is ideal for groups of up to 12 people wanting to reserve an exclusive booking to make the most of the private facilities and pool. Alternatively double rooms can be booked individually and meet a range of accommodation preferences. An exquisitely appointed king-size room with a large private balcony? Or a private streamside room? Villa Pesantian caters for visitors to Bali who yearn for peace, rest and a calming abode. Traditional Balinese life continues daily around Pejeng, where Villa Pesantian is situated. A stream meanders below the pool, while across the road there is an ever-flowing furrow of crystal clear water.